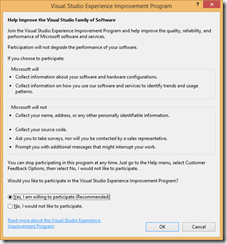 When you install Visual Studio, you are prompted to opt into a program to help improve Visual Studio. If you answer “Yes”, Visual Studio will send information back to Microsoft about errors that occur and features that are used. The information is sent during installation and later during your normal course of using Visual Studio. The Visual Studio team uses this information to learn how their product is used, how often the product is used, and where errors are occurring. All this information is helpful as they improve the product. Click the radio button next to "Yes I am willing to participate" and click the [OK] button. Of course, you can also opt out of the program by selecting the “No” radio button, but then you are not helping to improve the product. Those who opt out of this often do so because they fear for their privacy; but no personal information is transmitted, You can read about the privacy of your information here. Microsoft makes it easy for you to share information about Visual Studio usage because they want this information to help to improve Visual Studio. The Thrawn Trilogy consists of 3 novels: Heir to the Empire, Dark Force Rising, and The Last Command. The books tell a story that takes place in a galaxy far away, a long time ago. But it is not as long ago as the events of the 6 Star Wars movies. The story begins a few years after the the Rebel victory at the Battle of Endor at the conclusion of Return of the Jedi. Although the Endor conflict and its aftermath left the Empire weakened and resulted in the deaths of Emperor Palpatine and Darth Vader, The Empire still maintains a formidable navy commanded by Grand Admiral Thrawn, a brilliant military tactician. Han Solo and Princess Leia are now married and Leia is pregnant with their twins. Thrawn, in his quest to re-establish the Empire, enlists the services of Joruus C'baoth, the insane clone of a dead Jedi master, who is intent on enslaving Luke, Leia, and Leia's twins (the last of the Jedi line) and establishing himself as galactic dictator. The rebels match wits with Thrawn across multiple planets, the battles flowing in favor of each in turn. Both sides try to enlist the help of neutral parties, such as a guild of smugglers led by Talon Karrde and the Noghri, a race tricked into decades of servitude by Darth Vader and the Empire. In the final book, our heroic rebels face off directly against Thrawn and C'baoth for control of the known galaxy. These books are part of the Star Wars Expanded Universe (EU), the name given to books, games, and other media that describe the events of the Star Wars universe. Although LucasFilms recently announced that expanded universe stories are no longer considered canon, it is still fun to follow the further adventures of Luke, Leia, Han, Lando, C-3PO, and R2-D2. Zahn stays true to the characters created by Lucas. He also introduces fascinating new characters, such as Karrde, Thrawn, Mara Jade, and others, who appear in later EU stories. Along the way, Zahn weaves an exciting tale of action and intrigue, loyalty, and betrayal. It's not the most intellectually stimulating tale but it is loads of fun. Like an unexpected visit from old freinds. Today I am grateful I was able to complete a lot of work around my house yesterday. Today I am grateful for a few days without the pressure of driving hundreds of miles. Random Packer fans who showed me around Lambeau yesterday. Today I am grateful for the chance to visit 3 great user groups in northern Wisconsin over the past 3 days. Today I am grateful for drinks at The Lazy Monk, lunch at Taco Juanita, and conversation at The Green Mill - 3 great places to hang out in Eau Claire, WI. Today I am grateful for my first trip to Eau Claire, WI. 2 nights ago, I slept on the floor and got very little sleep. Today I am grateful for the air mattress on which I slept last night. Today I am grateful for my new home. Today I am grateful to be invited to my first MGX conference and for the free Lady Gaga concert last night..
Today I am grateful for free lattes and free Dove bars. Today I am grateful for all the people I met on my team at the DX dinner last night. Today I am grateful for a visit to the amazing Georgia Aquarium last night. Today I am grateful I attended my first Atlanta Braves home game last night. Today I am grateful for my first trip to Atlanta in about 10 years. Today I am grateful for a fresh start. And a chance to take back control of my life. Today I am grateful that I found my drivers license, which has been missing for a week. Today I am grateful for 2 great user group audiences in Indiana this week. Today I am grateful to see young people getting excited about software development. Today I am grateful to spend time with my mother for the first time since the death of my father. Today I am grateful that I am starting to get rid of all the crap I've accumulated over the decades. Today I am grateful for: 1. Attending the 125th anniversary Mass at St. Henry - my old church in Kentucky. 2. Lunch with Gary Desmarais and Patricia Desmarais. 3. Visiting my cousin Susan Jean Kight. 4. Surviving 2 severe thunderstorms on the drive home. Today I am grateful to the organizers of #Codestock, who put on a great conference and allowed me to be a part of it. Today I am grateful for the 50 years my sister Denise spent with us before she passed away, 5 years ago today. Today I am grateful for my first #Codestock in 4 years and for time spent with old friends last night. Today I am grateful for: 1. Great sandwiches and amazing potato pancakes at Izzy's in northern Kentucky. 2. A great audience at the Nashville Microsoft Azure Users Group. 3. Seeing Kent Fehribach for the first time in a year 4. Dinner and sidewalk music in downtown Nashville last night with Brian Sherwin and Kent. Today I am grateful for lunch with Jeeva and for watching soccer with my son Tim. Today I am grateful for an unexpected extra day at home between trips to help me recharge. Today I am grateful to spend the holiday weekend with family in California.